Many of us have a concept in our heads of Africa being large expanse of brown dust with a strip of green rainforest across the middle equatorial region. My experiences so far, felt like I was in this large expanse of brown dust all the time! No matter how many motorways cross it, everything around me was brown, moving to shades of red as I ventured further north to say Wonderboom, which is north of Pretoria and has an airfield and a King Air. Spring is in full swing now, and flowers are appearing all over the place. The roses in my garden are blooming, bougainvillea is flowering over walls and most spectacular to me are the jacaranda trees. Their flowers are purple and the flowering happens before any leaves sprout. This is a very surreal sight to me as there are these trees which look completely purple all over. Pretoria is famous for its jacaranda, it’s climate means there is little frost there even in the winter (not like Jo’burg as I found out myself!) so the trees do well there. In Pretoria there is a saying that if a jacaranda blossom falls on you head, it’s a sign of good luck. Students and pupils spend hours under the trees to try and catch a blossom on their heads as an omen to passing exams. 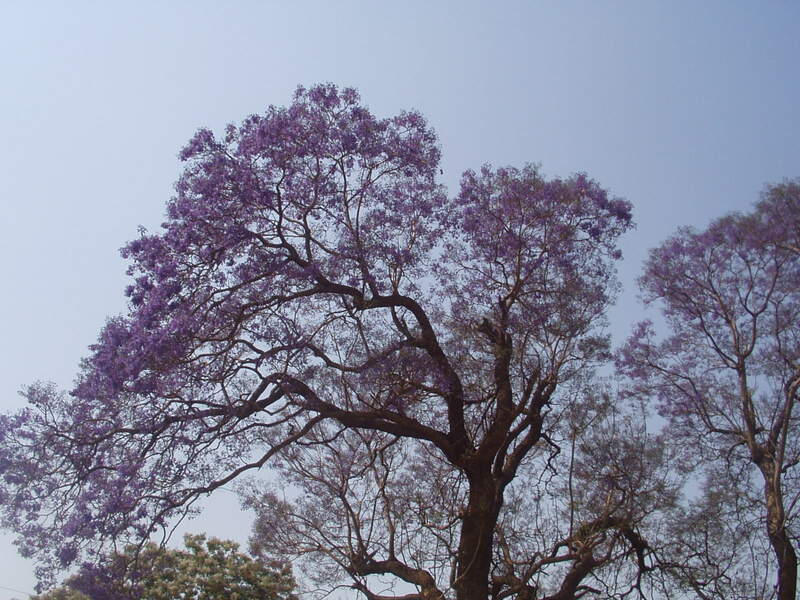 They are not indigenous to this area, being from Brazil originally and planting new ones is actually illegal now as they drink up too much water and there is concern that more jacaranda trees will have a bad effect on the water table.